Hmmm. 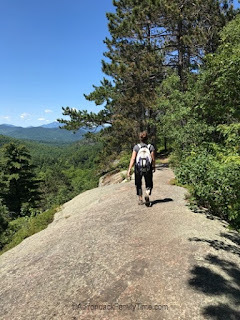 It leads to a discussion on John Denver, “Country Roads” and the moonshine, in that song, refers to the home-brew “white lightening” not an Adirondack hike. All references I’ve found to the name point to it being an amalgamation of the Algonquin words “pohqui” meaning broken and “moosie” translating to smooth. Some people believe the name refers to the flat rock summit and sheer granite cliffs. Those cliffs attract rock climbers from all over to attempt more than 50 rock-climbing routes with names such as The Waterfall, Fastest Gun, and Bloody Mary. We can see climbers as we pull in to the old DEC campground. We watch while two people inch their way from crevice to crack. The kids run out of the car to scramble up boulders surrounding the abandoned parking area. 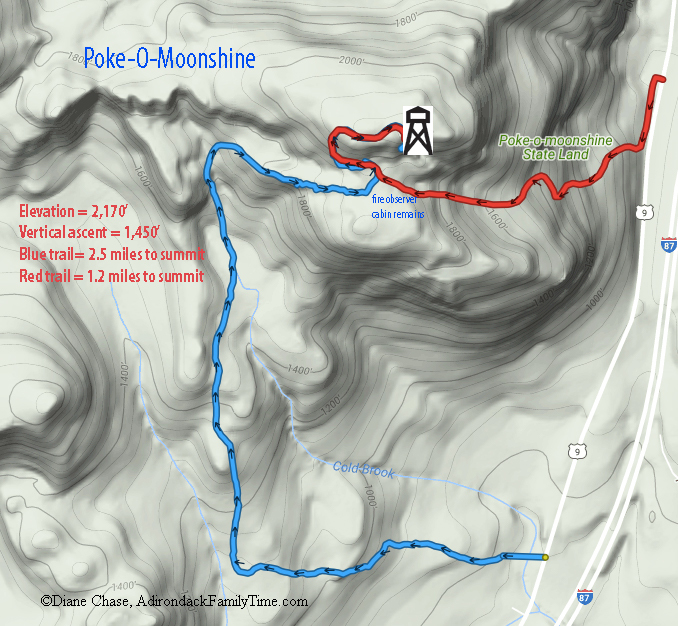 This campground has been closed since 2009.Poke-O-Moonshine has an elevation of 2,170' and a vertical ascent of 1,450’ with a fire tower on top. The hike is not strenuous though the ground is slick with leaf litter. Beavers cause flooding on part of the Blue Trail. 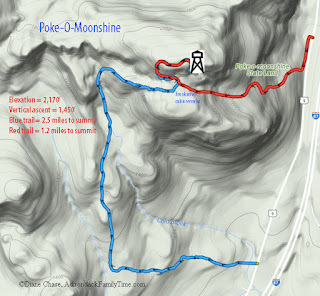 There are two trails to access the fire tower at the summit of Poke-O-Moonshine. The Ranger Trail (Red markers) starts at the southern end of the campground while the Truck Trail (blue markers) starts 1.0-mile south of the old campground entrance. Both trails have their benefits. We've also left a car at one parking lot and completed a loop but walked the extra mile roadside. The Ranger trail route starts at the southern end of the campground parking area. Park at the designated area and walk along the dirt road that parallels Rt. 9. The trail entrance starts to the right. This trail is steeper yet shorter. Though physically more challenging, it's not unmanageable for a young child as long as there is plenty of time and encouragement is given. The distance is 1.2-miles to the summit. The Truck Trail (blue markers) is longer (2.3-miles) and a more moderate grade. Though an easier walk, there are some obstacles of its own. Beaver dams block the river cause flooding so we have to scramble over fallen trees to find a shallow place to cross. 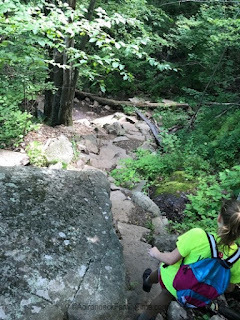 It is an relatively easy walk to reach the open rocks. Open ledges before reaching the summit. 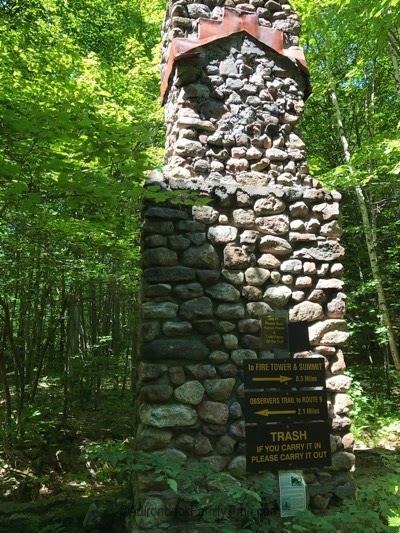 The two trails converge at the old fire observer’s cabin and from there is just .02-miles to the fire tower summit. We stop briefly to explore around the cabin’s foundation and stone chimney. We pass an open ledge before reaching the summit. A wooden fire tower was first erected in 1912 and later replaced in 1917 with the standardized steel tower standing today. 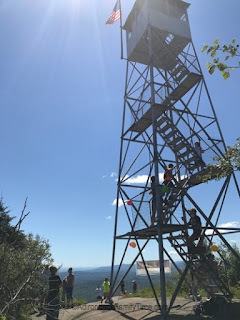 Recently (2017) the fire tower celebrated is centennial. The Osborne Fire Finder has also been renovated through fundraising. The circular apparatus consists of a brass sighting mechanism that pivots precisely in the center. An arrow corresponds with the compass reading when the sights line up with the point of the fire so the fire tower observer could precisely determine where the fire was located and notify firefighters. The Friends of Poke-O-Moonshine worked hard since the tower's deactivation in 1988. 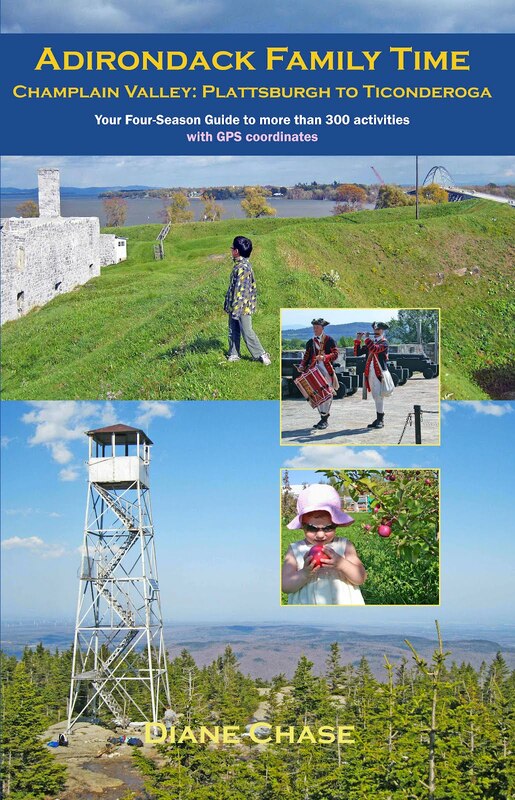 After years of fundraising, the tower is a safe place that is forever marked in the State and National Registers of Historic Places. 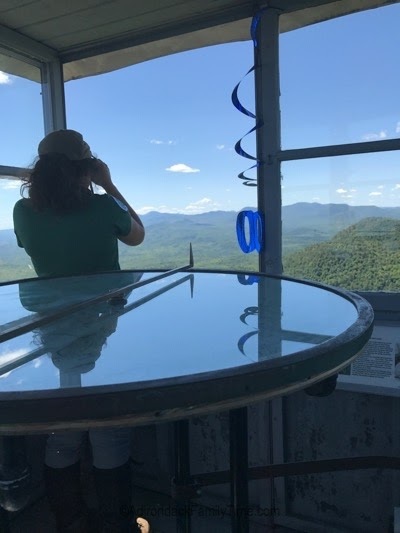 Climbing the fire tower leads to 360º views of Lake Champlain to the east, Lyon Mountain to the north, the Jay Range, Hurricane Giant and Gothics to the south as well as Whiteface Mountain to the west. We watch a peregrine falcon coast the thermals while we eat our lunch at the summit. The last thing we see is a line of snow geese flying in formation being swallowed by fog. It is now cold and damp on top so we work our way down collecting more acorns.